The International Union for Conservation of Nature has classified these harmless mammals as “Near Threatened.” So, helping them reproduce, as an aye-aye breeder, may also keep the species from becoming extinct. Actually, I don’t believe you can import Aye-ayes as pets—unless you’re one of those rich or famous people to whom the laws for regular people don’t apply. But, if it is possible to adopt an aye-aye, I offer the following pros and cons for your consideration. Pro: Some people think they look cuddly. Con: Some people think they look creepy. Pro: They don’t demand attention all day long. Con: They’re nocturnal and might keep you up at night. Pro: People will think you’re on the cutting edge. Con: People will think you’re one odd cookie. Pro: They have tiny mouths. Con: They are omnivores, and eat other animals. Pro: Most people consider them exotic animals. Con: They clearly resemble devilish gremlins. Pro: Daubentonia madagascariensis are lemurs. Con: They’re not nearly as cute as their lemur cousins. Pro: In an emergency, they’re edible. Con: In an emergency, they’re edible. 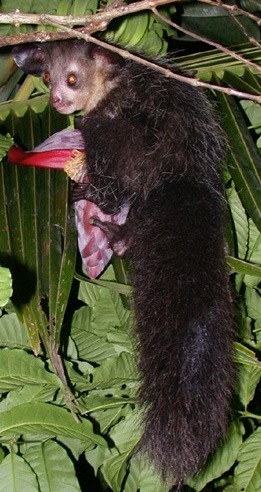 Pro: Aye-ayes may reveal God’s imagination & humor. Con: Aye-ayes just may have a less heavenly origin. You can either read it here, or view a recent treatment of it here. C.S. Lewis acknowledges the danger posed by possessing too much love—an idolatrous affection—for pets. Of course, there are other things we can love that way with even less justification than an animal. You can do something for the Peke, and it can make some response to you. It is at least sentient; but most poetolaters hold that a dead man has no consciousness, and few indeed suppose that he has any which we are likely to modify. Unless you hold beliefs which enable you to obey the colophons of the old books by praying for the authors’ souls, there is nothing that you can do for a dead poet: and certainly he will do nothing for you. He did all he could for you while he lived: nothing more will ever come. I do not say that a personal emotion towards the author will not sometimes arise spontaneously while we read; but if it does we should let it pass swiftly over the mind like a ripple that leaves no trace. If we retain it we are cosseting with substitutes an emotion whose true object is our neighbour. Hence it is not surprising that those who most amuse themselves with personality after this ghostly fashion often show little respect for it in their parents, their servants, or their wives. (“The Personal Heresy: A Controversy”). If we cannot express our goodwill to other people, it’s better directed towards dogs and aye-ayes than someone departed from this world. Which brings us back to the subject at hand. These furry little creature may not be the objects of the latest pet craze now, but it may be possible for you to initiate a new fad! 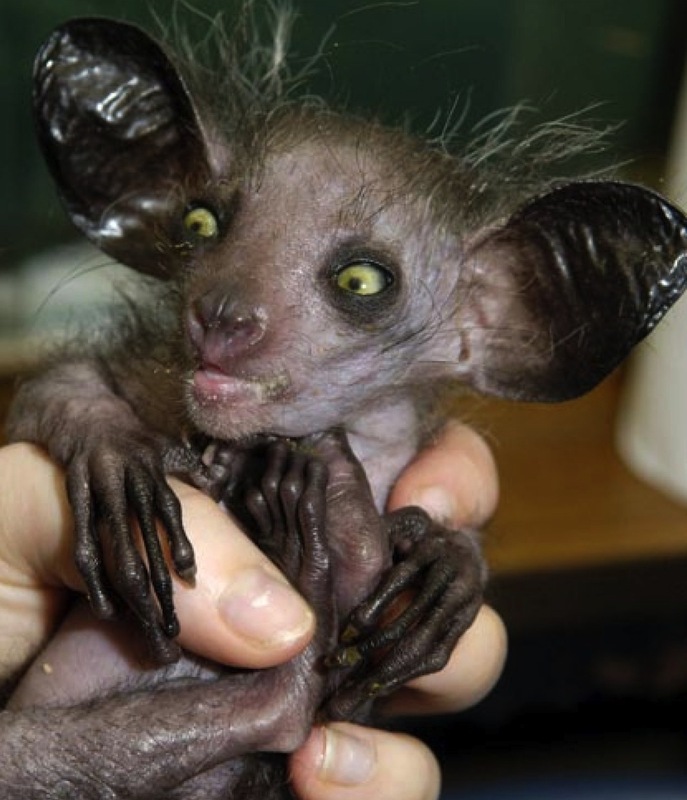 To make that possibility a bit more likely, allow me to close this column with a picture of a lovely aye-aye in its natural habitat. Now, that’s an animal one could easily consider cute and cuddly (as long as it keeps its paws to itself). I guess this is an example of so ugly it’s cute, sort of like those Chinese crested dogs. Given that choice, I’d probably opt for the aye-aye! You know how cats sometimes wake their owners up by sitting on their chests breathing in their faces? Can you imagine what it would be like to wake up to that? Geeeez! It was a dark and stormy night, the kind written about in spooky novels, and the clock had barely turned 3 a.m. when I felt it. Hot, putrid, and yet a little fruity…short, little puffs of breath interrupted my own rhythm. I felt a weight on my chest, that’s when I opened my eyes. “God in heaven! Save me!” I screamed, flung my arms, and threw off the covers that had been cuddling me as I rolled out of the bed and crashed into the floor. I jumped up, back against the wall, when I realized it was only little Beelzebub, my new pet aye aye. Now that’s the spirit! 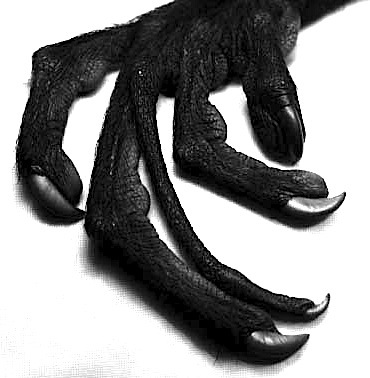 It’s inspiring to see just the sort of fiction a person can compose when they have an aye-aye as a muse! I think it looks like a cross between a Chihuahua and a vampire bat, and I’m not sure which of them I detest more! Okay, I’d have to go with the vampire bat by a slim margin. I have two words for your idea of an aye-aye craze: Nay Nay! The part of me that’s struggling knows it’s not right to judge things by their superficial appearance. I suspect they really are gentle and nonthreatening creatures. At first I thought it was one of those ugliest dog contestants! I agree. Besides, I’m sure they prefer living undisturbed in the rain forests. Called “aye-aye” (do you suppose) because of the eyes or because when you see it you say, “Aye-yi-aye!”? A perfect gift for Wednesday Addams. Funny! Now, how many of us would recognize that reference!?! “Coincidentally, Lewis would object with equal eloquence to Lewisolatry.” Yes, yes he would. So… what to aye-ayes look like BEFORE they are fed after midnight?